Simmons, Dave Navarro, Billy Sheehan, Bruce Kulick and Jeff Scott Soto. 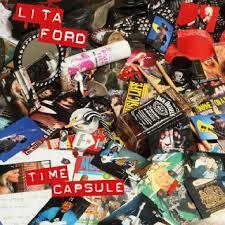 Then Lita went and put them all together and released an album. The results are magical. At least for those of us that love 80's hard rock. Time Capsule is raw. It's unadulterated. It rocks. And above all, it's good. While Lita has never had the pipes to create awe-inspiring vocals like Ann Wilson or Lzzy Hale, or the shredding ability of Eddie Van Halen or Randy Rhoads, her combination as a singer/guitarist/songwriter puts her in the realm of hard rock royalty. It's just a shame these songs never saw the light when it might have mattered. Here are couple of tracks from Time Capsule.